Join me for a weekend of painting, hiking and enjoying the beautiful outdoors in the Boise Foothills and along the Boise River. We will begin the weekend with some classroom based teaching where I will introduce you to the field paiting tools and some quick beginner techniques. After an hour or two we will head out to the Boise River or foothills for some hiking/wandering and painting. Once we pick out a good location to paint from I will provide instruction and one-on-one help to each attendee. The class size will be kept small to facilitate lots of one-on-one help and instruction. There are several purchasing options for this event. You can choose to participate both days or only one day. If you choose the one day option you must attend on Saturday for the instruction on tools and painting techniques. I will provide supplies or you can bring your own (please just let me know ahead of time so I know what to bring). There is also an option to purchase all of the supplies you will need for painting in the field which includes a filled watercolor travel palette, watercolor travel journal, waterbrush, pen, pencil and eraser. The items in the supply bundle come at my cost, it just helps you take the guess work out of trying to figure out what to buy and where afterwards so you can get to painting! This is a laid back class and you are welcome to stay for as long as you wish, whether that means leaving early or staying after the class has commenced. The only requirment is that you attend the first two hours of the Saturday class at Form and Function and arrive at the trail head within 10 minutes of the scheduled start time on Sunday. Expect to spend approximately two hours of painting in the classroom and then 2.5 hours of painting in the foothills on Saturday, the rest of the time will account for travel and hiking. We will meet at a trailhead (TBD) on Sunday and hike to a few different viewpoints to paint on Sunday. We may do some group stretching activities throughout as sitting for long periods can become uncomfortable. Please come prepared with water, snacks, sunscreen, sun glasses, a hat, gloves, hiking shoes and appropriate clothing (pack layers). The weather can vary depending on the viewpoint and because it's April the weather can change dramatically and rapidly. A rain coat or windbreaker is adviseable, as is a warm layer. Hikes range from easy to moderate and may be up to 6 miles in length broken up throughout the day. Please prepare accordingly and let me know if you have any health concerns or disabilities ahead of time so I can do my best to accomodate them. Please email with any questions prior to event. Come join us for an evening of watercolor and wine! In this beginner-friendly class we will create a beautiful mountain landscape while sipping on the wine of your choice. This is a very laid back class and is perfect for individuals and groups alike. All supplies will be provided, all you need to bring is yourself. Wine and food not included. Please come 10-15 minutes early to get wine/food and settle in. Click button below to purchase tickets. Come join us for an afternoon of watercolor and handcrafted beer! In this beginner-friendly class we will create a beautiful starry night scene while sipping, snacking and relaxing in the great brewery atmosphere. This is a very laid back class and is perfect for individuals and groups alike. All supplies will be provided, all you need to bring is yourself. Beer and food not included. Please come 10-15 minutes early to get drinks/food and settle in. Click on button below for tickets. Come join us for an evening of watercolor and wine! 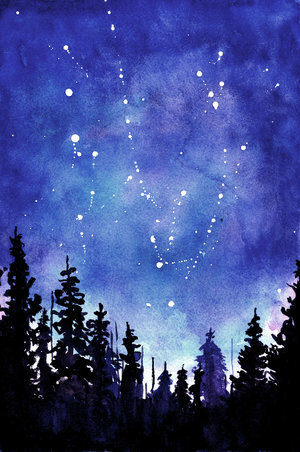 In this beginner-friendly class we will create a beautiful starry night scene while sipping on the wine of your choice. This is a very laid back class and is perfect for individuals and groups alike. All supplies will be provided, all you need to bring is yourself. Wine and food not included.